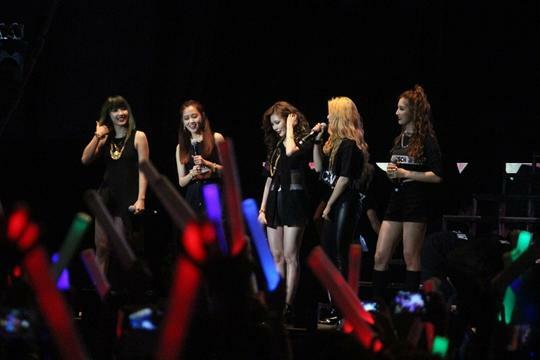 4Minute successfully finished their solo concert in Myanmar. On April 4th, girl group 4Minute held a solo concert in Yangon, Myanmar under the title of '4Minute Fan Bash In Myanmar.' It was the first time for 4Minute to hold a solo concert in Myanmar, and approximately 7 thousand fans attended the concert. 4Minute members arrived in Myanmar on April 2nd at night, and over 1 thousand local fans greeted the girls at the airport. 4Minute's fans in Myanmar installed many different billboard advertisements and placards to celebrate 4Minute's first visit to their home country, and local medias also headlined articles about their arrival. The concert was held for about two hours, and 4Minute members said, "It was a huge pleasure for all of us to visit this wonderful country of Myanmar, and we are feeling a profound gratitude for an amazing memory and experience that you have allowed us to make here. We promise to get back as soon as possible, and we hope that everyone would keep showing us the same phenomenal love and supports." Meanwhile, 4Minute members got back to Korea on April 6th, and they are going to resume their new album promotion.